This weekend was the epitome of work hard play hard. We got so much accomplished and we also had lots of fun in the process! Let’s get started! Friday started out with a carnival at Olivia’s school. They typically do a 4th of July parade, but this year they decided to change it up and have a carnival instead. 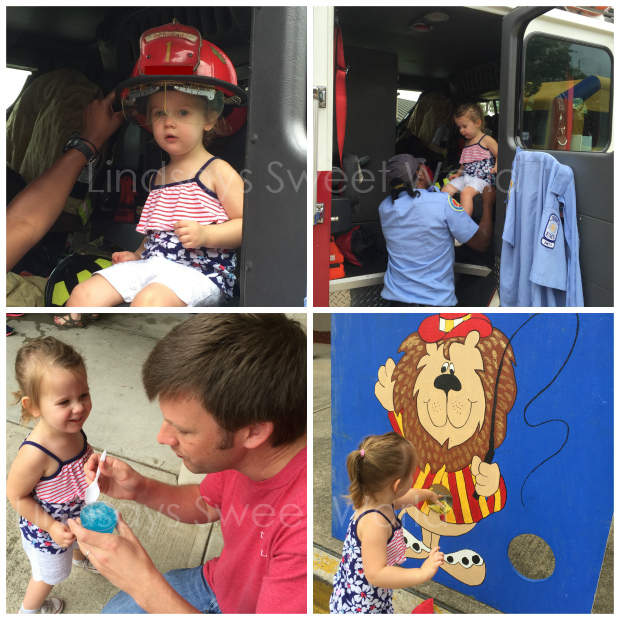 There was a bouncy house, snow cones, watermelon, a firetruck, and lots of carnival games. Olivia loved the bouncy house but she kept getting frustrated because she kept falling over a ton. Haha. When the carnival was over, B and I both had to go back to work, but both of us were able to sneak out a bit early to start our long weekends! Friday evening we went out for Italian for dinner, and then we bought a mattress set for Jacob’s big boy bed. We had just gotten home around 7:30 and the kids and I were playing and all of a sudden the power went out. Very bizarre since it was perfectly sunny outside with not even the slightest of breezes. I expected it to come right back on, but after five minutes or so it was still out, so I jumped on our neighborhood Facebook page to see if it was just us or if any of our neighbors had lost power as well. Sure enough, tons of people were already on there asking what was going on, and it appeared that about half of the neighborhood still had power and the other half did not. I immediately called the power company and they said that they were aware of the problem, but that it would be around 9:45 before it came back on. Eek. With temps still looming in the mid-90’s at 7:30, I knew that we were going to burn up if we had to wait until almost 10 for the power to come back on. Not the way I wanted to spend my Friday night. Fortunately it ended up coming back on around 9, so B and I celebrated with some Moscow Mules and then we settled in to watch The Martian. Oh, and apparently a tree had fallen on the power line up the street and that’s what had put us all out. Strange that a random tree would just fall when there were no storms. It was an interesting evening, needless to say! Saturday we got up and made some red, white, and blue confetti waffles. The kiddos love them! After breakfast was over, we got to work on Jacob’s big boy room. B painted while I cleaned out every inch of his room – drawers, shelves, toys, closet. Not one thing in that room went untouched and we now have a heap of stuff that we’re getting rid of. Shhhh, don’t tell Jacob. Our happy little helper... she's wearing four tutus in this picture. FOUR. Lol. We took a break for lunch, popped Olivia in her crib for her nap, and then kept at it until it was time to get ready for church. Fortunately both kids were very well behaved all morning and we were able to get the entire room painted and cleaned out. Unfortunately, I ended up hating the paint color and I decided that we were going to have to repaint. Oh man, was I mad. I had been going for a light brownish-grey, but with the lighting, the color had turned out to look tan, peach, orange-ish, and yucky. It was way too warm when I had been going for a cool tone. After the kiddos were in bed, B and I watched The Longest Ride and then called it a night. Sunday Jacob and I got up before everyone else and headed straight to his room to paint. I wasn’t about to ask B to do it again since he had done the whole thing already… I felt terrible! However, when he got up, he came to join me even though I didn’t ask him too (I sure did marry a good one) and we knocked it out quick! He did part of the trim, and then I rolled the whole thing while he started converting the bed from the toddler bed to the full size bed. We were able to get the entire room repainted and part of the bed put together before it was time to stop and head to my mother-in-law’s for lunch. They grilled and we celebrated my brother-in-law’s birthday with cake and ice cream. It was too hot to do anything outside if it didn’t involve being in water, so we let the kiddos play in the playroom while we cleaned up. You may have already seen this if you follow me on Instagram, but their neighbors always line the streets with little American flags and it looks so festive! I may have to do that next year! After lunch, we went home, put O down for her nap, and then B and I finished putting J’s new bed together. He was so excited when it was finally done! He kept climbing up and climbing down and jumping on it and rolling around. I was so excited that he was excited. My mom’s whole side of the family was there – all of my aunts, uncles, cousins, and grandmother, and it was a blast! We had more food than we could eat – grilled burgers and hot dogs, homemade mac and cheese, coleslaw, pasta salad, potato salad, broccoli salad, baked beans, watermelon, cookies, and cake. And of course, Hershey Pie and Jell-O shots made by yours truly. We swam while my uncle grilled. My cousin Shelby assists a swim instructor during the summer, so she started working with Jacob and Olivia to get them comfortable in the water. As y’all may remember I’ve mentioned that Olivia loves the water, but Jacob has always hated it. Well, Shelby was so wonderful with them, that both of them ended up going under water for the first time ever!! Olivia loved it so much that she did it over and over and over again but Jacob was content with the one time. Lol. I was just shocked and proud of him for doing it the one time. My aunt captured the perfect picture of Olivia’s first time going under. Olivia's first time going under water!!!! Both kds also started jumping off the side and into the pool and neither of them had ever done that before either. They both loved it. Definitely a success for swimming this weekend! We all stopped to eat, and then the kids swam some more with Shelby while we all sat around. 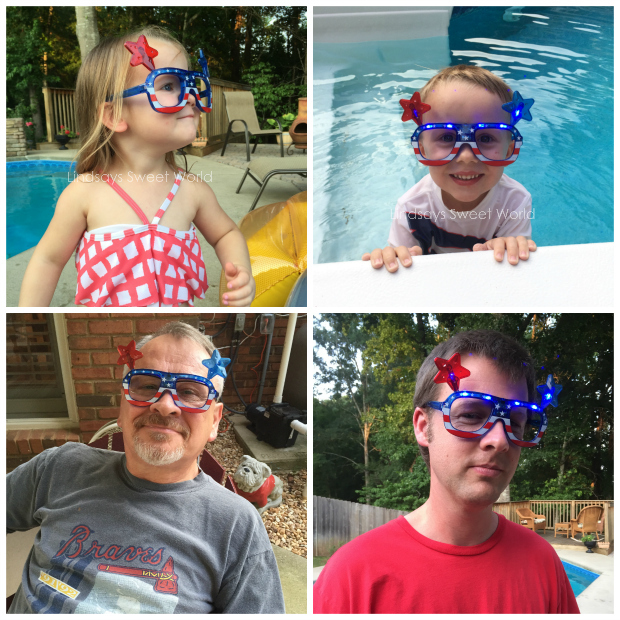 We had brought some cute 4th of July props and everyone took turns wearing these goofy flashing glasses that I had gotten in the Target dollar spot. A big group of us did Jell-O shots together, and then we did sparkers. Once it got dark, we made the kids get out of the pool, we put them in their jammies and turned on a movie for them, and then the adults busted out Cards Against Humanity around the kitchen table. I had never played before, and goodness was it hilarious! I think B laughed so hard he was practically crying a few times. We ended up staying out way past the kids’ bedtimes, and by the time we got home they were both exhausted. 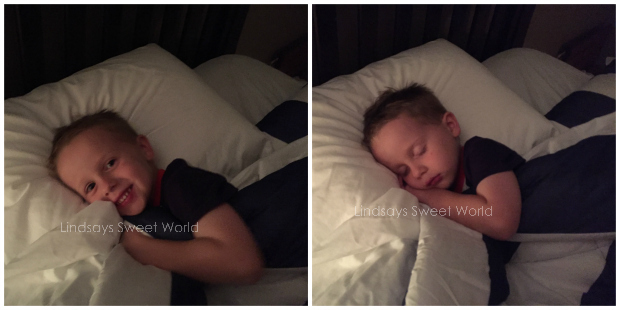 Jacob hopped up in his big boy bed for the first time and passed out. He slept all night in there and didn’t fall out so we will call it a major success! Monday morning everyone slept until 9. NINE! And it was glorious! We ate breakfast, and then loaded up to go to my mother-in-law’s neighborhood pool with my sis-in-law and one of her boys. We stayed there all morning and the kids were super happy in the water again. Olivia let me dunk her and then she kept sticking her face in the water all on her own. Jacob didn’t want to dunk again, but he was happily jumping off the side again all morning. He has definitely come a long way since last summer and I could not be more proud of him! It’s so exciting to watch him overcome his fears! We stayed home all afternoon Monday and then had an early dinner followed by fireworks out on our back porch. Olivia was loving it until our neighbors started doing a ton of HUGE ones and then she was done. DONE. Haha. The best part is that she let me hold her like a baby all evening and that was perfectly fine with me. :o) It was the perfect ending to the long weekend, and I sure do love this little family of mine! I hope you all enjoyed your weekends as much as we did! Oh, and did I mention that mine’s not over yet? I’m off today because Jacob’s summer camp is closed this week… we will be starting the fun part of his new room (decorating!) and heading to his first swim lesson this afternoon so wish us luck! Happy Tuesday! 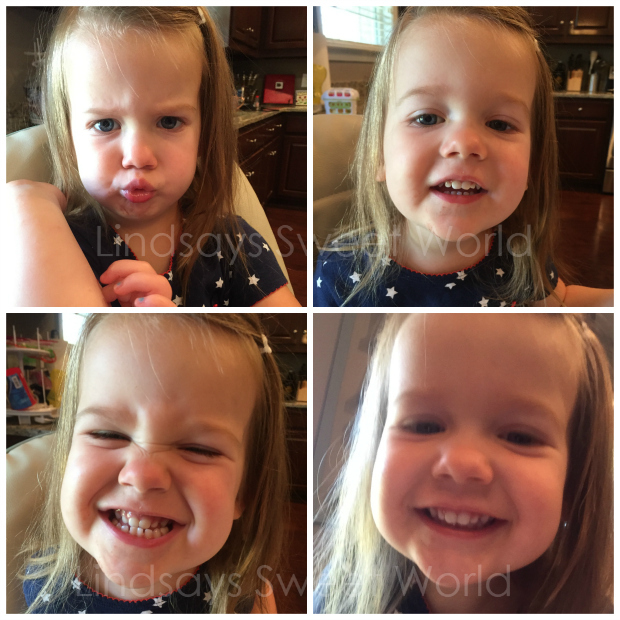 Oh my goodness, what a fun-filled weekend! That 4th of July party sounds like so much fun! I can't wait to see Jacob's room after you have it all finished. Enjoy your extra day off! You had a busy weekend! I love all your outfit photos with Olivia, they're perfect. Cards Against Humanity is always a must at every family gathering we have. Did you know they have expansion packs and a holiday edition one? We're currently redoing my son's room and he did not care for the fireworks either. Have fun decorating! Good luck today, Jacob! Sounds like a very fun filled weekend! 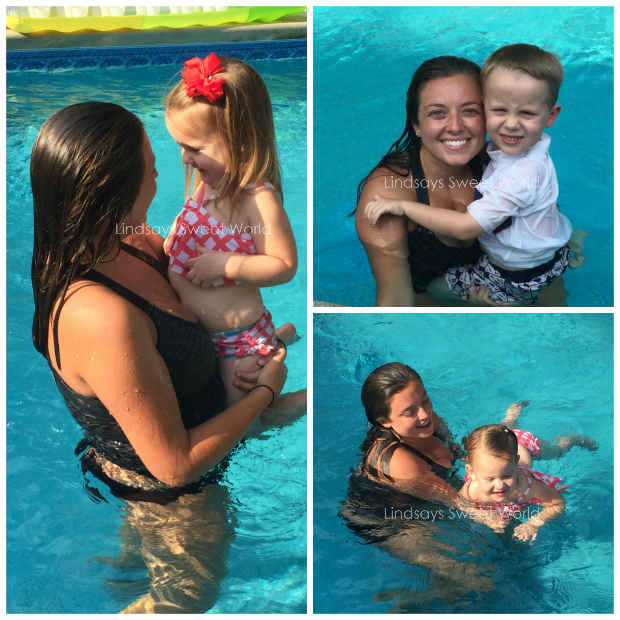 I'm glad you were able to enjoy so much time with family and go swimming! It was overcast here all weekend, but we still did a few sparklers after dinner yesterday. When Emerson heard the big fireworks go off he was sleeping, it woke him up and he was screaming! He was not a fan and it took him forever to go back to sleep. haha. I love your shorts, they're so cute. I love all of your festive outfits! And so glad you are off work today--enjoy your break! You guys had a jam packed weekend! But looks like it was quite fun, with a bit of work in there too. LOL! Loved all of the pictures! OH goodness what a BUSY weekend girl. Nothing, I repeat NOTHING is worse than paint regret. I had to repaint the dining room AND an accent wall in our bedroom. So frustrating. I bet it turns out amazing though. Jumping in the pool, SO awesome. I bet swim lessons go GREAT for him. All y'all's patriotic outfits are FANTASTIC!! Also, those waffles sound and look so good. What a fantastic weekend you had! This weekend looks like a BLAST! Glad you weren't without power for long! Oh my gosh. I love your weekend. Sounds like a blast. I can't wait for those kinds of weekends. And are you going to share your jell-o shot recipe? I love the family picture! XOXO It looks like you had a wonderful 4th of July weekend! What an awesome weekend and great photos! We have those same light up glasses. So fun! Yay for the kids going under water. Glad Cards Against Humanity was so much fun! Happy Fourth! Can't wait to see Jacob's new room! Do you have any bed rails for him? We still use the rails for Cash. Yay!!! What a fun weekend! Congrats on both kiddos going under the water for the first time, congrats on them jumping into the pool and congrats on Jacob sleeping in his new big boy bed for the first time! What a weekend! Oh and Cards Against Humanity - I think I pee myself everytime I play that game. Oh man. It's something else, isn't it?! Yes! It really was a huge weekend! So many milestones! And I'm exhausted from all of it. Lol. And yes, that game is crazy. Nothing like hearing your grandmother read some of the craziness on those cards! Lol. what an AWESOME weekend! Your whole family is so cute and festive with the decor and glasses and Jello shots! I love it! And I want to be part of your family!!! Jacob looks so sweet in his big boy bed!!! We still need to re-decorate Austin's room.. there is a lot of baby stuff that doesn't really match in there. he wants to pick out the paint color.. so we might have a paint situation like you guys had!